The Kindergarten Level 1 Reading Program, is suitable for kids between the ages of 4 to 6. Children will learn short vowels a & e, beginning and ending consonant sounds. The will learn how to read words, sentences and 2 short stories. The Kindergarten Level 2 Reading Program, is suitable for kids between the ages of 4 to 6. 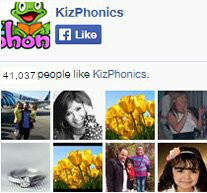 Children will learn short vowels i, o & u, ending and beginning consonants & digraphs. The will learn how to read words, sentences and 2 short stories. The 1st Grade Level 1 Reading Program features a review of all the short vowels, beginning and ending consonants. Your children will learn words with the S blends, consonant digraphs ch, sh, th, wh and ph. They will also learn the soft C and G sounds. The 1st Grade Level 2 Phonics Program features the long a & i with the silent e. Kids will learn how the silent e changes the sounds of words. This level also includes vowel digraphs ai & ay, vowel digraphs ee & ea and final y as long e.
The 2nd Grade Level 1 Phonics Program features the long o & u with the silent e. This level also includes vowel digraphs like oa & ow, ui & ue and final y as long i. Special vowels like aw & ew will be also be learned. Register Now to Unlock the Full Wealth of this Site. You may choose to instead buy the contents of this website as books and CDs. In that case, you can buy sets of our course from the store. Click on a set to purchase all the courseware. Please note that the contents of the hard copies are the same as the online materials, but without updates. If you would like both online access and books, contact us for discounts. Want hard copies of our products? No problem. 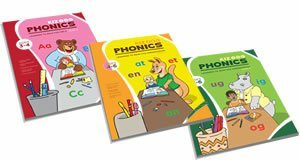 You may order our phonics activity books and more from our store - for Preschool & Kindergarten. Each set comes with CDs and the playing card sets and board game. Want hard copies of our products? No problem. 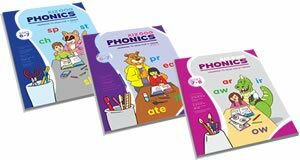 You may order our phonics activity books and more from our store - For 1st Grade & 2nd Grade. Each set comes with CDs and the playing card sets and board game. The teaching set is complete with board games and phonemic cards. 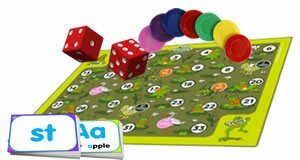 we have grapheme cards, phoneme cards, alphabet cards which can all be used with the board game for fun phonics learning.